Wash only full loads to get the maximum use of energy, water, and detergent every time. 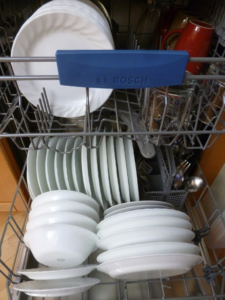 Air dry dishes by using the air-dry option or propping the door open after the final rinse. Run your dishwasher at night in the summer to reduce daytime heat buildup in the kitchen and help prevent blackouts. Replacing your dishwasher with an Energy Star qualified model could save you 10% in energy costs per year! ← Energy Tip of the Week 17: Have a Low-Energy Labor Day!